If you aren’t familiar with our Tangible Taverns line, this series of PDFs is dedicated to bringing life back to the local watering hole while making the GM’s job a little easier. All of our taverns are designed to be slotted into just about any adventure, but this week we bring you a few specific Pathfinder RPG adventures that can easily host a Tangible Tavern or two. 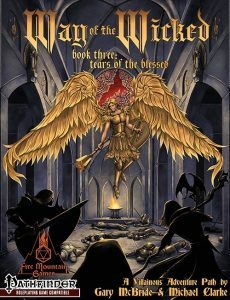 This adventure, the third module of the Way of the Wicked adventure path by Fire Mountain Games, spends most of its page detailing the Vale of Valtaerna, but it begins travelling to the city of Ghastenhall. Some details are given about this city, the first one of a decent size the PCs have encountered since their escape from prison, but many are glossed over with the assumption being that the PCs get cracking on the Vale. The city of Ghastenhall, which has a plethora of culture, is bound to be full of taverns, and just about any Tangible Tavern could be found in and around the city, but for us, it will always be home to The Bull & The Bear. Yes, Tears of the Blessed was the beginning of our Tangible Taverns line. During this long standing campaign the PCs set up shop in Ghastenhall and ended up purchasing a local tavern, which they used as their homebase, an excellent source of income, and a foothold to make inroads to eventual rulership. Whether your PCs take it that far or not is up to them, but this tavern can easily be inserted in this adventure. In addition, with its obsession with the arts, Ghastenhall is the perfect location for a dinner theatre like Simon’s. Give the PCs a break from their sinister plots with the antics of the colourful faces at this playhouse. 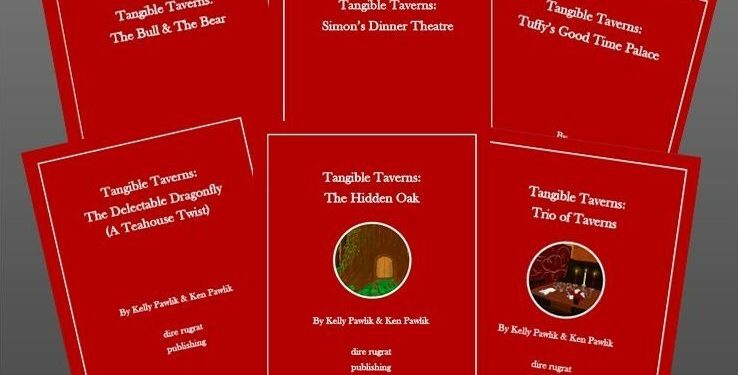 Pick up Tangible Taverns: The Bull & The Bear and Tangible Taverns: Simon’s Dinner Theatre today. 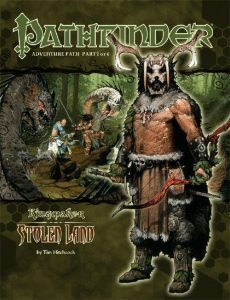 The Kingmaker adventure path has PCs traipsing across vast swaths of untracked wilderness as they seek to build both their fortune and a kingdom. Stolen Land, the first book of the campaign, provides the PCs with a good home base in Oleg’s Trading Post, from which they can hexplore the virgin wilderness. But what happens if they don’t want to travel dozens of miles back to the Post after a run of bad luck? What happens if they get into a spot of trouble and just need a little R&R time to recover? Enter The Hidden Oak! This tavern, located in the bole of a massive tree in the heart of whatever forest you want to place it in, will give the PCs plenty of opportunity to unwind while interacting with the misfit forest denizens it houses, and gives them the chance to build relationships with powerful allies such as the tavern’s proprietor Beatrice, or with the mysterious sage Crescenzo. Plus, PCs can get a leg up on their next foray into the wood by eating some of the magically delicious food provided at the tavern! Pick up Tangible Taverns: The Hidden Oak today. The PCs must make their way from the small town of Sandpoint to the coastal metropolis of Magnimar. The route is doted with taverns and inns in such a manner that travellers can easily reach the next establishment after 8 hours of travel where they can rest up for the night and continue on the next morning. Blackberry Bill’s is a small stone tavern that can easily be placed just about anywhere, but with his rugged nature and aptitude with a weapon, it stands to reason Bill, a former adventurer, can easily take care of any troubles that come his way, and make a few coins off his jam while doing it. PCs are bound to enjoy the blackberry treats they can find in this eclectic tavern before continuing on with their travels. Blackberry Bill’s is one of three taverns found in Tangible Taverns: Trio of Taverns. 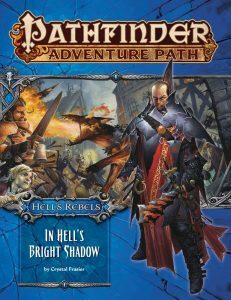 Hell’s Rebels is probably my favourite of Paizo’s recent adventure paths. In it, a group of PCs gets to build up the Resistance in the Chelish city of Kintargo, and possibly free it from the infernal clutches of the thrice damned House of Thrune! Who doesn’t dig poking their fingers into the eye of Golarion’s least lovable purveyors of devil worship? If you’re looking for a location to foment dissent against the system, look no further than The Delectable Dragonfly. This ladies (well, self identifying as female) only teahouse is a fantastic location to build an army, pick up and leave coded messages, or just get a nice cup of tea and finger sandwiches. The revolution starts today! Pick up Tangible Taverns: The Delectable Dragonfly today. When a big part of the premise of the adventure is for the PCs to explore the seas and ports of The Shackles, many taverns, inns, brothels, and other establishments are bound to be introduced. 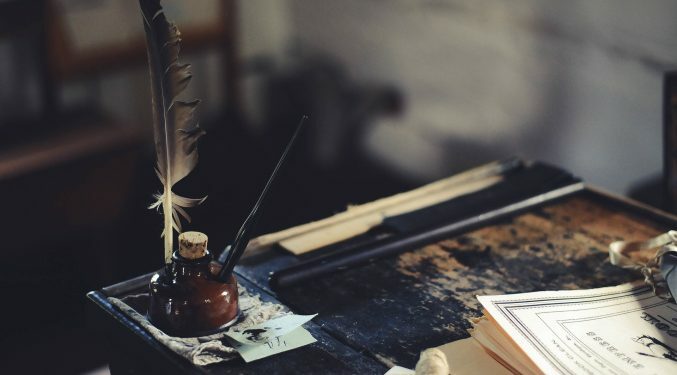 Sometimes its easy to throw out a name and a brief description, but when the PCs will be sticking around a little longer, it’s a great time to drop in a Tangible Tavern. If you are looking for a shifty tavern down near the docks, look no further than Tuffy’s Good Time Palace. Worn out, tough, and laden down with a supply of pickled food and cheap beer, Tuffy makes the perfect host for fresh-of-the-boat pirates who haven’t seen the shore in days. For those pirates who fancy themselves a cut-above-the-rest, let them head inland a bit and pay a visit to the Angelic Imp. Well decorated and in demand with the well-to-do, this little tavern is the perfect place to drop a lot of coin on a good meal, and maybe conduct a discrete business deal. A free sample version of The Angelic Imp is available, but for all the NPCs and a couple of stat blocks, look for Tangible Taverns: Trio of Taverns. You can find Tangible Taverns: Tuffy’s Good Time Palace here. 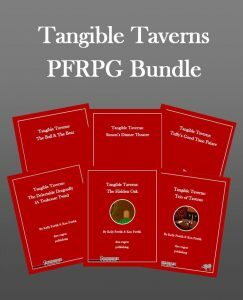 If you like the idea of using Tangible Taverns, you can collect them all in the Tangible Taverns Bundle. Have you used a Tangible Tavern in one of your adventures? Share your story below! Goblins are a hot topic of conversation in our house right now. Dire Rugrat Publishing is hard at work on a product that features this mischievous little creatures, and our little ones don’t miss a beat. We’ve been talking about goblins in general, but also sharing some of the tales and legends of this usually evil little creatures. Rugrat #1 was particularly interested in the story of the Benevolent goblin whose magical drinking horn was stolen by a traveller, and was eventually gifted to a king. 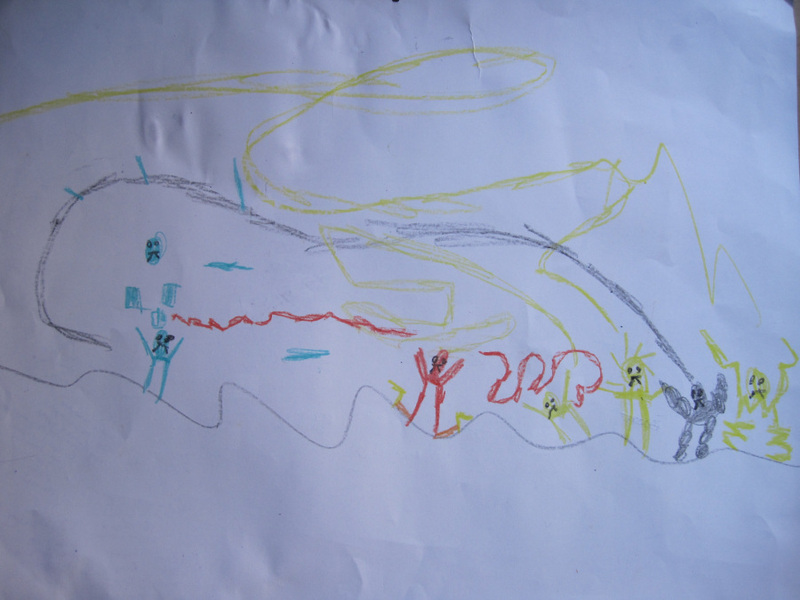 The other day I found Rugrat #1 hard at work on a picture. 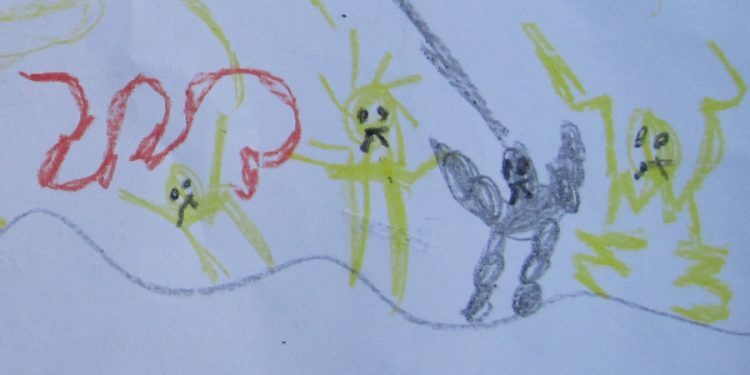 He loves to colour and is always drawing things: the solar system, pokemon, dinosaurs, whatever is on his mind. This particular day it was goblins. When he was done, he presented it to me. All the goblins are fighting. Whoever wins get to take over the town hall. It was quickly evident Rugrat #1 hadn’t drawn typical goblins, so we talked about them. Turns out his love of pokemon (and their various types and attacks) coupled with his new interest in goblins merged for something pretty cool. The goblins you see are different types. There’s “Stoney” the stone type goblin, “Electry” the electric type, “Icey” the ice type, “Grasser” the grass type, “Flarey” the fire type, and finally… “Klanger” the king type. You can see their various “attacks” as they fire electricity, fire, etc at each other. Some work together. The King and fire type work together. The grass and ice work together. All of the others work by themselves. The king types don’t always take over the place. Right now the stone type is in charge. He understands how important team work is. Have you had any fun goblin encounters? Ever used any goblin variations? If you love goblins, or are hoping to give them a bit of a make-over in an upcoming game, keep an eye out in March. Dire Rugrat Publishing has just the thing! Some NPCs make excellent allies, others are debilitating nemeses, but some are just sad. 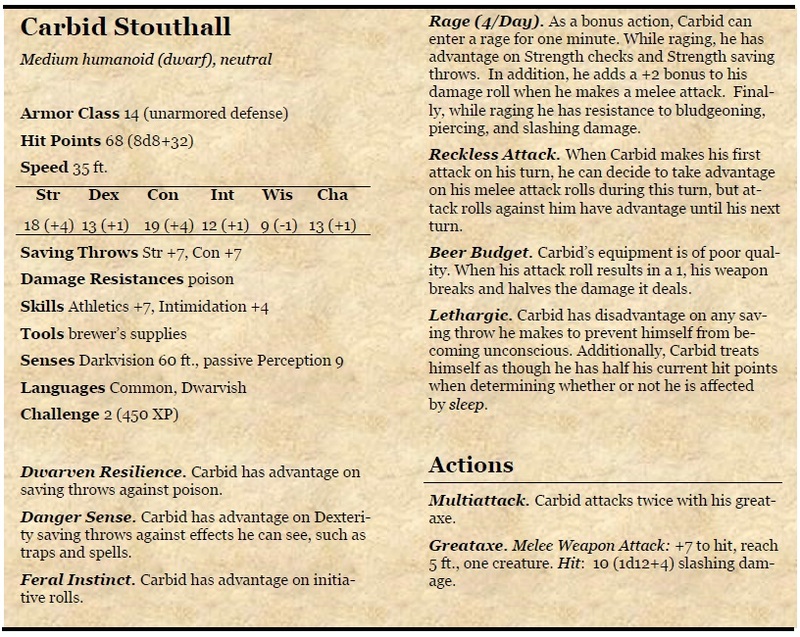 In this series of posts we bring you Flawed Foes. These NPCs may once have held great potential, alas, their flaws have created substantial hurdles. Don’t let that stop you from enjoying some good old role-playing fun though! Carbid was once a champion warrior, idolized by both young and old. Anytime the threat of danger presented itself, Carbid was at the front line, defending his clan with gusto. Many an enemy was slain by his hand, and numerous tales spoke of his bravery. Over mugs of ale around the warm fires his people would feast and afterward, might pull out cards or dice and play games. Carbid enjoyed the games immensely, and was always happy to make a wager. He quickly developed a gambling problem, and unfortunately, did not have enough skill to back it up. Many a bet was won against the great hero until the clan agreed betting with Carbid, and ultimately taking his money and belongings, showed great disrespect to the warrior who had saved them so many times. Carbid often tried to convince clan members to wager with him anyway, though they always refused, prompting him to spiral into a rage. His fellows would take cover, waiting for the anger to subside, offering him food and drink and other means of placating him. One day Carbid was travelling with a few of his clansmen when they came to rest in a tavern a few days journey from their home. It was here he joined a game of cards, against the wishes of his fellows. The game started well enough, and Carbid, excited at the opportunity to gamble, continued to play hand after hand. His opponent quickly turned the tables on him, taking all of Carbid’s valuables in two hands. Certain he could get them back, Carbid begged for one more hand. With nothing physical to offer, the stranger asked for a single favour. Carbid hastily agreed. And lost. 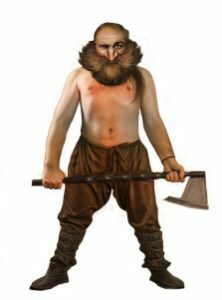 With nary a copper to his name, and a favour owed, the dwarf walked away, head low. The next morning, he and his clansmen were set to return home when the stranger beckoned Carbid over and called in the favor. He asked Carbid to travel east to a nearby lake, defeat the ogre that resides in a cave there, and return with the head. Carbid was eager to return to his people, but he knew he had to stand by his promise. Enlisting the help of his fellows, Carbid set off. The trip took several days, thought the creature was easy enough to locate and defeat. The party returned triumphant a week after they had departed from the tavern. The stranger was not there, but upon inquiring, Carbid was given a note of thanks. A bit perplexed, Carbid disposed of the head and, with his allies, set off for home. 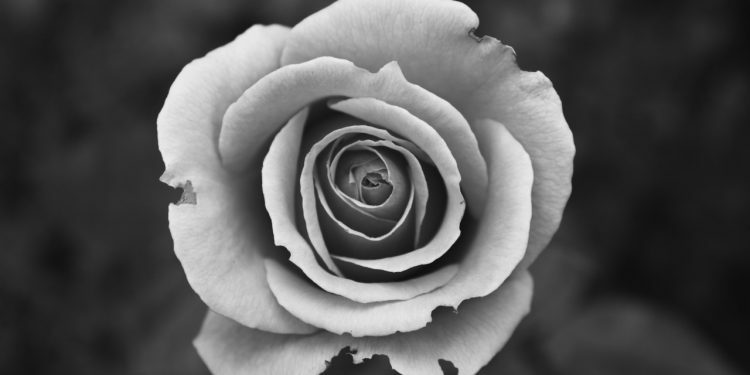 What they found was a grave sight; their clan hold had been burned and the residents slaughtered. The stranger had set them up, eager to have the bravest warriors occupied while he lay waste to the settlement. Carbid’s companions were furious. Carbid was devastated. Now haunted by his actions, Carbid travels alone with inferior quality weapons, spending every copper he has on liquor in the hopes of drowning away his sorrows. Carbid suffers from horrific nightmares, causing him to feel tired even after what most would consider to be a restful night’s sleep. 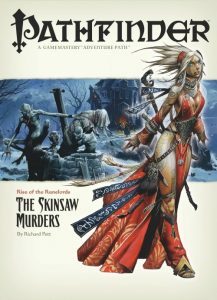 You can find more unique NPCs in our Tangible Taverns and 5e NPC collections on DriveThruRPG. What did you think of this NPC? Did he make an appearance in your game session?